At some point I’m actually going to tell you about something I made with all the produce I’ve been buying. We’re in the midst of renovating our only bathroom, and every spare second is devoted to returning the room to a semi-functional state. Next week, an actual recipe. Pinky swear. 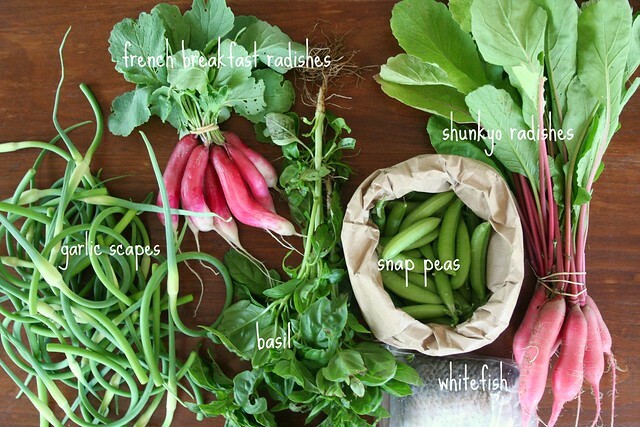 Oh, you’re probably wondering what Shunkyo radishes are. They’re an heirloom variety my favorite farmer grows. I didn’t need two types of radishes, but he tucked them into my basket as a freebie. I think I might pickle them. 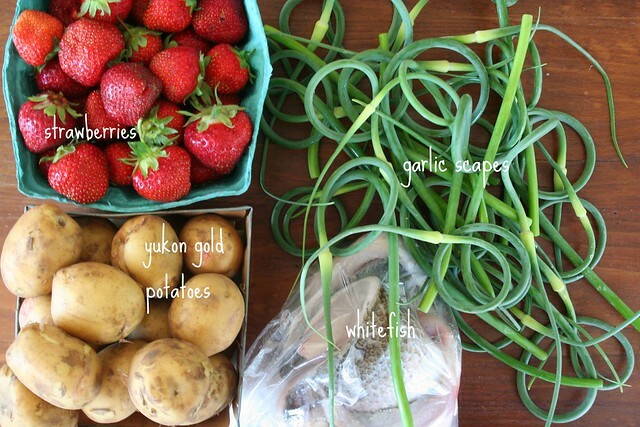 More strawberries, more garlic scapes, more fish. And this week, potatoes! Last week, Amy asked what to do with garlic scapes. I’ve got a grilled garlic scape pizza in mind, but you can use garlic scapes in any recipe that calls for garlic. Just chop the scapes up and use them in place of garlic cloves.